The barn is a wonderful part of man's architectural heritage. Through many centuries, it has evolved almost as a living, breathing thing. A barn needs to be filled with hay and occupied by animals in order to maintain the humidity of the wood. The skill and community spirit of a barn raising is legendary. As with many other things, we are living in a "say goodbye" period on our planet. Except for a few groups such as the Amish and the Mennonites, barn-building skills have been lost. Steel and aluminum structures are replacing the traditional barn, and many more barns are disappearing than being erected each year. The traditional barn is built into a hillside so that the hay wagon may gain easy access to the large upper part of the barn. At the same time, the stable is readily accessible to the animals down below from the barnyard. Occasionally, the lower part of the barn is designed with a breezeway effect so that animals may stay in the shelter of the barn and yet still be outside. I recall seeing this scene during a driving blizzard. 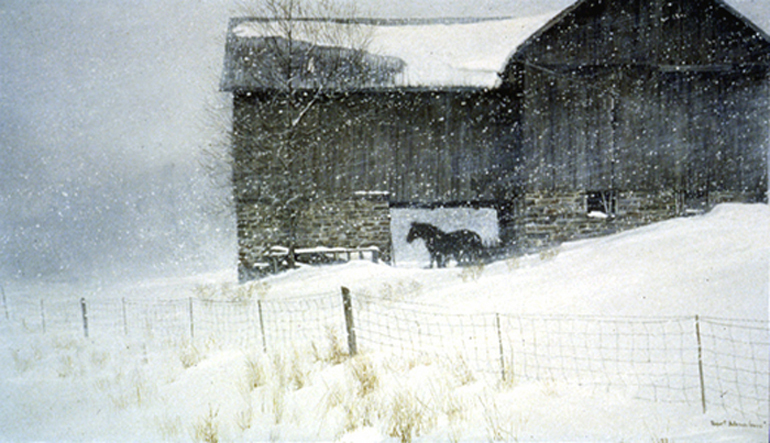 An old draft horse is patiently waiting out the storm.